Richard Hughes has stunned the world of horse racing by giving up his riders’ licence in protest at new rules governing use of the whip. Hughes and his whip in happier times. 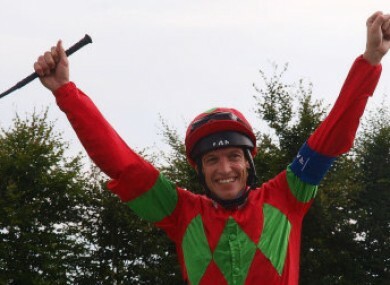 RICHARD HUGHES WILL relinquish his riding licence with immediate effect unless the British Horseracing Authority revise their new rules on use of the whip. The Irish jockey received his second ban inside a week at Kempton on Thursday evening, having also been handed a five-day suspension on the first day the rules came into force on Monday. Jockeys can now only use the whip seven times during the course of a Flat race, with only five of those strikes allowed inside the final furlong. The ten day ban incurred by Hughes on Thursday proved to be the final straw and he insists that the BHA set a trap by saying a jockey could only use the whip five times inside the final furlong. Hughes told Racing UK: “I’ve handed my licence in until further notice. I’ve been trying to obey the rules this week and when the rules came in we all thought seven was a fair number, but then they set a trap by saying you could only hit them five in the last furlong. “The new rules mean you actually hit them more, as you have to get two into them before the furlong pole and then you have five for the final furlong. I was always told as a young lad the last jockey to go for stick usually wins. I don’t think I can do my owners justice any more. Email “Hughes gives up riding licence in protest at new whip rules”. Feedback on “Hughes gives up riding licence in protest at new whip rules”.